This is a strange and beautiful natural pool with just a hint of aliens! Thousands of years ago the roof of a huge underground cavern collapsed revealing a beautiful subterranean pool and river. The emerald green waters cover an area of about 4225sqm and on the north side of the pool is a broad rocky slab that functions as a natural beach. The surrounding limestone cliffs of Hamilton Pool provide shade and help keep the water cool during the hot Texas summers. Large stalactites still hang from the roof of the Grotto and add to the primeval atmosphere of this natural geological wonder. During the wet season a waterfall cascades over the southern edge of the grotto creating a veil of water and transforming Hamilton pool into a fantasy landscape. 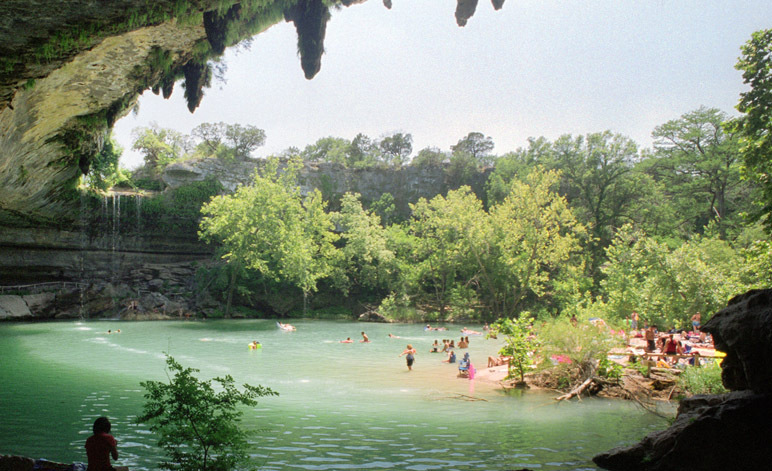 The waters of Hamilton pool eventually join the Pedernales River and wind up in Lake Travis. Hamilton Pool can be found off Highway 71, some 23 miles (37 km) west of Austin, Texas. 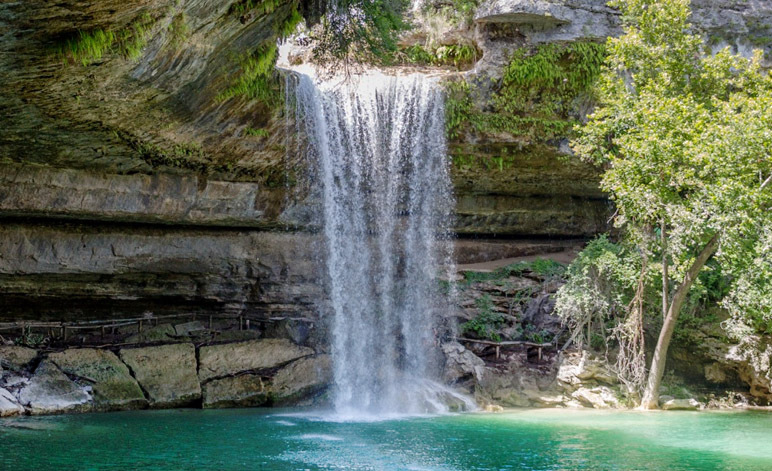 It has become a popular destination for local people and is located in the Hamilton Pool Preserve which is part of the larger Balcones Canyonlands Preserve. Both areas are classed as a protected environment and are carefully monitored and ecologically maintained. The popular natural swimming spot known as Hamilton Pool near Austin, Texas. The land was originally occupied by Tonkawa and Lipan Apaches before being acquired by Morgan C. Hamilton. The pool was said to have been rediscovered by the 8 year old son of German immigrants who had purchased the property as a ranch and it was the Reimers’ family that opened it up to the public around 1882. The natural beauty and somewhat mysterious atmosphere of the pool has led to it being used as a film location. Movies such as The Hot Spot (1990), Teeth (2007), Predators (2010) and The Tree of Life (2011) all had scenes shot at Hamilton pool. Since late 2014 the area around Hamilton pools and generally south of Austin has become something of a hotspot for seeing UFO’s with dozens of reports ranging from floating lights to large triangular shaped craft drifting over the ranch lands and nature preserves.